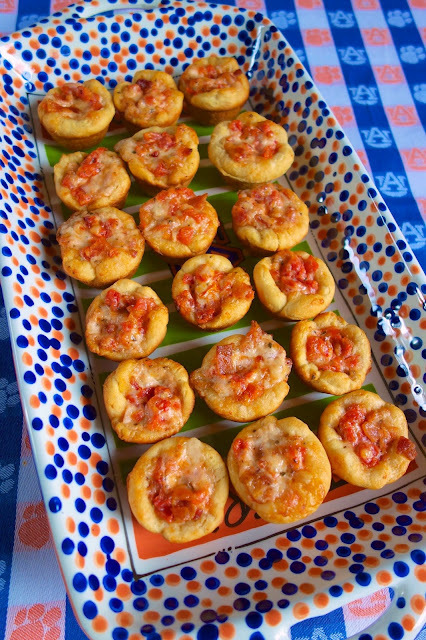 Tomato Bacon Cups - SOOO good!!! Great party appetizer!! Refrigerated biscuits stuffed with bacon, tomatoes, swiss cheese, mayonnaise and basil. Makes a ton. 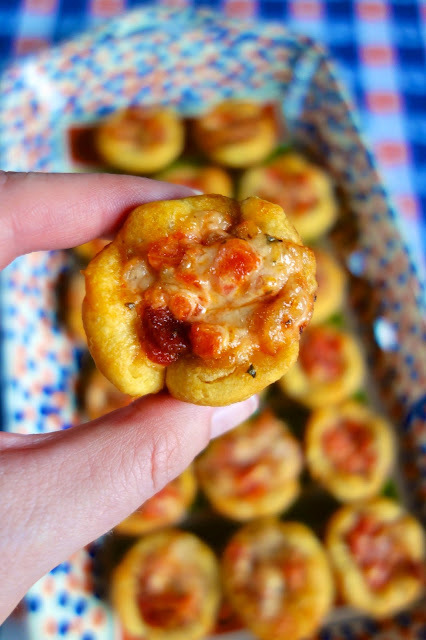 Great make ahead party food!! I've this recipe on my list of things to make for several years. The pastry chef at The Ritz Carlton cooking school told me about this recipe. She said she made it for all the chefs after work and they loved it. I finally got around to giving them a try. She was right, these Tomato Bacon Cups are great! I can't believe I waited so long to try them. I like to make the filling ahead of time and fill the biscuit cups right before baking. I think these would also freeze well. If you do freeze them, bake them first. The biscuits won't rise as well if you freeze the dough frozen. This recipe makes 60 biscuit cups. Plenty to feed a group of hungry tailgaters! Preheat oven to 37º5F. Lightly spray mini-muffin pans. Combine bacon, tomatoes, cheese, mayonnaise and basil. Set aside. Separate each biscuit into 3 thinner biscuits. Press each layer into the mini-muffin cup. Fill each cup with the bacon mixture. Bake 10-12 minutes, until golden brown. I've done these in mini phyllo cups and they are delicious! I just want to say thank you for being specific on what kind of biscuits you use in your recipes. All too often, I'll find a recipe that just says "1 container refrigerated biscuits". There are SO many sizes and variations to refrigerator biscuits!! So, thank you and keep up the good work. Carol - phyllo cups sound great! treesy - I know exactly what you mean. Hope you enjoy them! Hi! Do you think I could use fresh, seeded tomatoes instead of the canned? We have a TON of tomatoes from our garden! Thanks! MackNCheez - absolutely! Hope you enjoy them! Do you think fiesta cheese would taste just as good?